"Focal Point columnist Dave Berry writes about big news from Sweeny, Texas"
Caption as it appeared in the column “The Gulf Intracoastal Waterway winds through Brazoria County, carrying a stream of barges along the Texas coast. 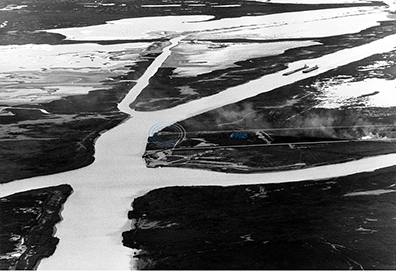 In this shot from 1980, two barges cruise side-by-side near the mouth of the San Bernard River. Sweeny is about 20 miles upriver. (Photo by Dave Berry)"
Editor's note: The view is looking west towards Cedar Lakes with the barges eastbound. Editor's Note: Looks like FOR scooped THE FACTS! This same article appears in today's paper Thu Feb 18 –– our article was posted on the web yesterday Wed Feb 17. Read the rest of the story in today's FACTS. * Dave Barry is a Pulitzer Prize winning author and columnist, who wrote for The Miami Herald from 1983 to 2005.